Hardwood vs Laminate flooring – The pros and cons. Which is best for you! Hardwood or laminate flooring are often choices offered by luxury home builders. Calgary homebuyers that desire the look of wooden floors must decide between hardwood, engineered hardwood, or a laminate. 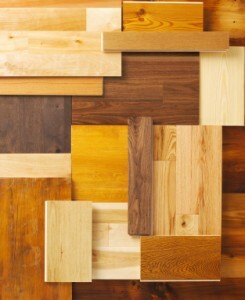 Which flooring is best for you is determined by a number of factors. While the resale value of your home is a consideration, durability must also be considered as you compare the look, price, ease of repair, and maintenance of hardwood versus laminate flooring. Hardwood flooring is natural wood throughout. It’s surface is finished with either polyurethane or stain-penetrated and waxed. It’s more expensive, but depending on the variety of the wood, can add considerably to the resale value of your home. Engineered hardwood consists of cross-sectioned laminate layers with a thick hardwood veneer on top. Laminates are manufactured from composite wood that’s pressed and glued together at high temperatures. A Laminate’s surface is a photograph of hardwood coated with melamine that can range from a dull matte to a glossy finish. Hardwood is less durable for high traffic areas and fades when exposed to the ultraviolet rays of the sun. It’s easier to dent and scratch, but if properly cared for, can last a lifetime. Laminate flooring can last 20 years. The surface of laminate flooring is treated with a UV protectant. Laminate flooring can cost up to 40-percent less than hardwood but is less susceptible to dents and scratches. Moisture is a major consideration for luxury home builders. Calgary experiences long winters and hardwood flooring is highly susceptible to moisture damage. Since engineered hardwood is less susceptible to moisture and lasts up to 80 years, it’s often the choice of home builders. Maintaining polyurethane coated hardwood requires dust-mopping, sweeping, or vacuuming. The floor is re-coated with finish to restore the shine. Frequency of re-coating depends on the amount of traffic. A polyurethane finish isn’t waxed and regular cleaning products for vinyl or tile flooring should not be used. Penetrating-stain and waxed hardwood surfaces require the same maintenance; however, a buffer is used to maintain shine. When buffing is no longer effective, a special cleaner must be used and the surface is re-waxed once or twice a year, depending on traffic. Laminates simply require regular sweeping or vacuuming and damp mopping; a mild cleaning solution is used for high traffic areas. Hardwood flooring is repaired by sanding and refinishing. Sanding removes the finish, scratches, and dents before a new coat of finish is applied. For laminates, dents and scratches are filled, color-matched, and refinished using a repair kit. Sections of the floor can be replaced, but depending on age and wear, the color of new sections may differ slightly from older sections. Easily scratched by claws, hardwood will require more maintenance if you have pets. Laminates are more durable; however, the higher the gloss, the more water spots and paw prints will show. The choice between hardwood and laminate flooring is offered by many luxury home builders. Calgary homeowners that plan on selling their homes soon, must consider that hardwood or engineered hardwood increases the resale value of their home considerably more than laminate flooring. Laminate is less expensive to purchase and install, is easier to maintain, provides considerable durability, but lacks the longevity of hardwood. High quality laminate looks just like the real thing, is low-maintenance, and if kept clean and in good shape, gives a home the look of hardwood floors. Ultimately, your budget and long-term needs will determine your choice of flooring options.